We suggest that you abandon the myth that growing a strong Thoroughbred Racehorse foot is difficult. Pretty much without exception all Thoroughbred Racehorses on the Aloeride have grown strong hooves and healthy feet. They no longer have the problems commonly associated with TB’s hooves and they become easier to shoe. Thoroughbreds are known for having two different front feet, they seldom match. If they are left to grow unevenly and aren’t balanced with regular trims, it is like you wearing a sneaker on one foot and a work boot on the other. You just couldn’t jog evenly like that. It is assumed that the relative thinness of walls and sole of the Thoroughbred foot make it more susceptible to trauma, injury, and hoof capsule distortion. Actually thin + hard would be just fine. It is only thin + softer that causes flares, cracks, underrun, collapsed and sheared heels. Quarter cracks, grass cracks, sand cracks, toe cracks, dry or moist corns, while line disease (seedy toe) are unheard of in horses supplemented with Aloeride, often it is why horses with hoof trouble started on Aloeride. 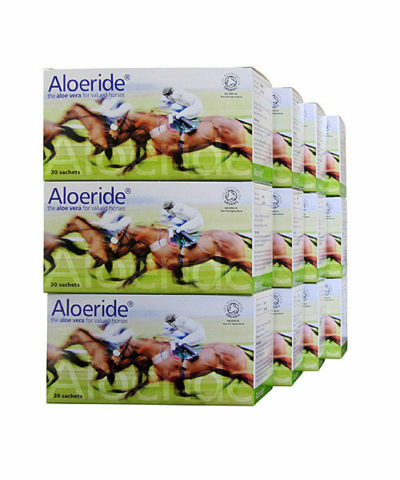 Thoroughbred Racehorses on Aloeride get an abundance of natural-in-ratio nutritional building blocks with which they build much stronger walls and more resilient soles. This is where affordable, unrivalled quality and proper dosage of organic aloe vera comes into it: Aloeride. Hoof capsule distortions are slow sprains due to semi-static weight bearing lasting hours. This is you getting plantar fasciitis standing still for 20+ hours at a drinks party. Hoof capsule distortions are sprains because the line of gravity doesn’t move through the foot at a time when it has little or no arch support from the ground (therefore relies solely on the perimeter hoof capsule for support). Hoof architecture is designed for top-down dynamic pressure and ground-up arch/sole support from the track. Hoof structures are grown from the building blocks you choose to feed, it is your easiest handle on a common problem. 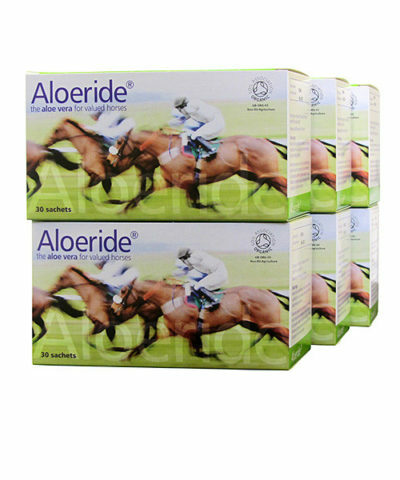 Aloeride not only makes growing a strong Thoroughbred Racehorse foot easier, it also helps your TB cope with the inflammatory aspect of sprains. In compromised feet, a temporary arch support bandaged onto the feet when stalled may be helpful. Thoroughbred Racehorses’ feet need not be sensitive to moisture. This is as self-explanatory as stating that, without wearing a Barbour, you get soaked standing in the rain. Thoroughbred Racehorse’s feet become sensitive to water ingress only if their naturally protective fatty acid and phospholipid barriers fail. That same barrier also protects feet from drying out and becoming brittle. Growing a strong Thoroughbred Racehorse foot should not be difficult when the horse ingests the right feedstuff to build with. As you know, the sole grows from the third phalanx (P3, coffin bone, pedal bone is much lighter than other foot bones because it is perforated by numerous vascular channels). For a healthy circulation under P3, the sole of your Thoroughbred must be at least 15 mm thick. If circulation gets compressed (i.e. solar papillae blood vessels that project down into the sole are short to nonexistent in the compressed foot) → fewer nutrients are delivered to tissue → the sole is not growing at a healthy rate → the hoof capsule changes → you’ll start to notice an underrun heel → the walls get thin → the walls become brittle. The anti-diabetic effect of aloe vera helps peripheral circulation, semi-static weight bearing hinders. Horses that are fed an optimum diet have an 80% increase in hoof-sole-border size compared to those fed a limited diet. Optimum nutrition encourages maximum bone and hoof size development. Importantly, hoof size proportionate to body size encourages soundness. Aloeride helps you reach optimum nutrition (intake as well as uptake). Aloeride gives your horse 7 out of the 8 dietary essential amino acids (Isoleucine, Leucine, Lysine, Methionine, Phenylalanine, Threonine, Valine, there’s no consensus on Tryptophan yet. 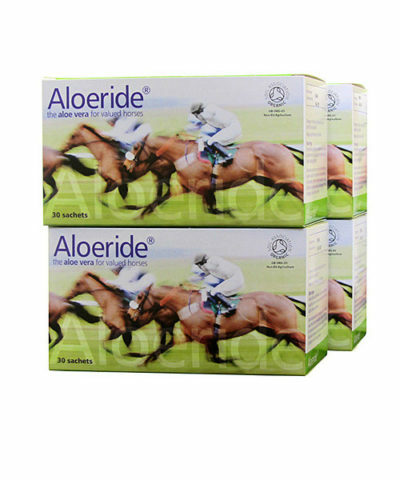 Aloeride gives your horse 12 dietary non-essential amino acids (Alanine, Arginine, Asparagine, Cysteine, Glutamic Acid, Glycine, Histidine, Proline, Serine, Tyrosine, Glutamine, Aspartic Acid). Aloeride gives your horse vitamin B1, B2, B3, B5, B6, B9, B12 and vitamin A and C. Aloeride gives your horse the inorganic minerals Calcium, Magnesium, Potassium, Sodium, Zinc, Iron, Phosphorus, Manganese, Molybdenum, Copper and Chromium. Next to these nutrients, Aloeride gives your horse other, aloe-vera-specific nutrients that you can never get from even the best feed. Next to that, by firmly supporting digestion, Aloeride promotes the uptake of nutrients in regular feed. Aloeride is a 100% pure, natural product with Nature’s own nutrient-to-nutrient ratios. Frankly this unique wide spectrum of nutrients would do little if it wasn’t delivered in a properly meaningful quantity! 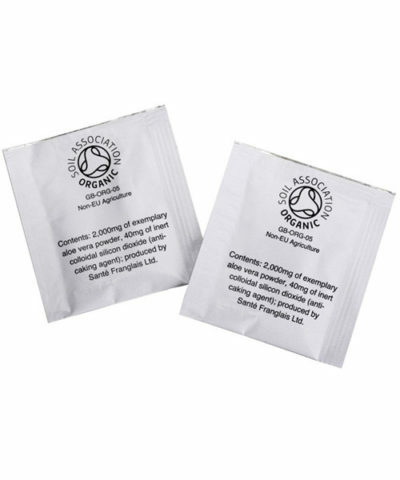 No worries, each sachet of 2,000mg equates to a very generous serving of 400 ml of original and organic juice!